As Alberta’s largest city - and Canada’s third-largest - Calgary, or “Cowtown” as its commonly known, is a bustling cosmopolitan centre occupying a dramatic setting between sweeping prairies to the east and Rocky Mountain peaks just 50km west. As the nickname suggests, the city remains staunchly proud of its rich western heritage, and yet fully embraces all the trappings of an ultra-chic, forward-looking metropolis. Many of Calgary’s best sights and activities are concentrated centrally in and around the downtown area, making it ideal for exploring on foot. From its impressive architecture and wealth of family-friendly attractions, to its cutting-edge eateries, vibrant cultural scene and buzzing nightlife, Calgary is fast blossoming into one of Canada’s coolest destinations. In the heart of Calgary’s busy downtown core, you’ll find the popular pedestrian area Stephen Avenue Walk, home to some of the city’s best architecture, shopping, dining and tourist attractions. This is one of Calgary’s oldest areas, home to picturesque cobblestone streets and over 30 restored sandstone buildings, recognised as a National Historic District. Many of these facades have been carefully reconstructed, keeping their original features intact, whilst being converted to house an eclectic mix of boutiques, bars, eateries, art studios and nightclubs. Bustling outdoor markets, tempting food trucks, lively street performers, as well as numerous festivals further add to the area’s vibrancy, particularly during the summer months. In and around this strip you’ll find some of Calgary’s most prominent architectural landmarks. Check out the impressive sandstone Old City Hall, an important civic landmark and one of the largest historic buildings of its type in Alberta. 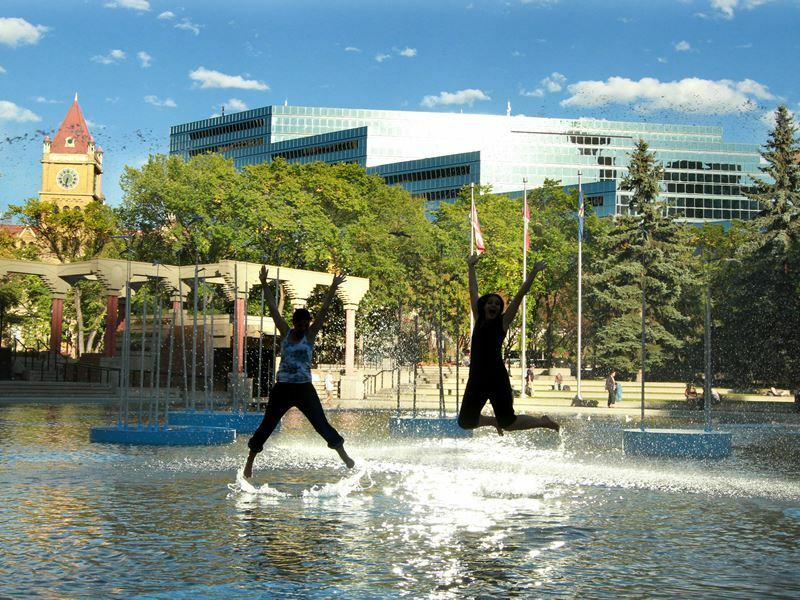 Across the way, you can’t miss the Olympic Plaza, a popular meeting spot that’s home to a pool, fountains and an ice rink, according to the season, as well as playing host to some of the city’s most high profile festivals and concerts throughout the year. Marvel at the towering Bow building, the tallest structure in Canada outside of Toronto. And, of course, you won’t want to miss Calgary tower. At 191 metres, it features the largest observation deck in Western Canada, boasting outstanding panoramic views over the greater metropolis, extending all the way to the Rocky Mountains visible on the horizon. Stephen Avenue is also home to CORE shopping centre, one of the best places in the city for a spot of retail therapy. With everything from luxury department stores to one-of-a-kind boutiques, touting international labels and unique local creations alike, you’re bound to find plenty of interest to take home with you. If you’re in need of a breather, head to the sprawling Devonian gardens, an indoor tropical oasis located on the 4th floor of CORE. In a somewhat unexpected location, its filled with lush foliage, colourful flora, sparkling fountains and several beautiful fish ponds. Downtown also harbours Calgary’s thriving cultural district. The Glenbow Museum is one of the province’s most renowned attractions and a must-visit for all those eager to learn more about Western Canadian history. It contains over a million artefacts spanning multiple exhibits dedicated to aboriginal culture, frontier exploration and early pioneer life. There are also around 28,000 artworks on display, as well as plenty of hands-on activities that are great for keeping the kids entertained. Another highlight of this district is the Arts Commons, an expansive arts facility with plenty to entertain culture hounds of all types and ages. 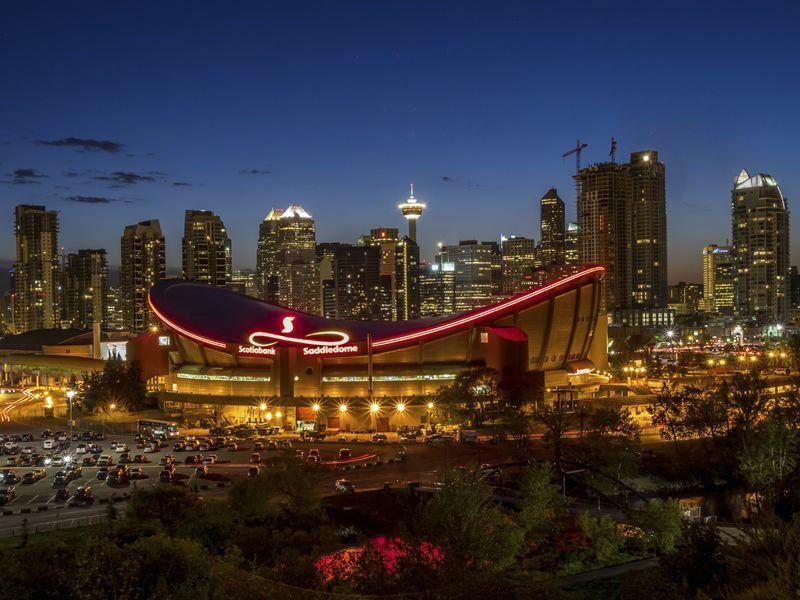 It hosts regular performances by Theatre Calgary and the acclaimed Calgary Philharmonic Orchestra, whilst the surrounding area is brimming with many smaller theatres, galleries and concert halls all concentrated in an easily navigable few blocks. Located just a short stroll from downtown, this picturesque island park is worth a visit in itself, as well as being home to a couple of Calgary’s most worthwhile attractions. Surrounded by the Bow River, the park features grassy fields, play areas and plenty of well-maintained trails, perfect for walkers, cyclists, families and those just looking to relax. There are a couple of great foodie options here as well. Head to the colourful stalls of the nearby Eau Claire Market to pick up picnic supplies, or treat yourself to a delicious meal at the upscale River Café. The park also plays host to the renowned annual Calgary Folk Music Festival, along with plenty more outdoor concerts, plays and festivities throughout the summer months. Nearby, you’ll find Calgary Zoo, Canada’s second-largest zoo and one of the city’s most popular attractions. Housing thousands of animals hailing from a variety of geographical regions, along with botanical gardens and a prehistoric park, it’s sure to be a big hit with the kids. Areas of the zoo faithfully recreate the natural habitats of the wildlife – you can venture around the African savannah, explore tropical rainforests or check out the nocturnal area to view a range of fascinating species. Not far away, you’ll also find TELUS Spark, a brand new attraction dedicated to exploring the fascinating worlds of science, technology, art and their intersections. A wealth of exhibits, demonstrations, programs and theatre showings provide hours of educational and fun-filled experiences. Calgary’s Retail and Entertainment District, located close to downtown, is known to locals as the “Red Mile” (in honour of the city’s favoured colour) and is one of the city’s premier spots for shopping, eating, dining and drinking. It’s a pedestrian-friendly neighbourhood home to hundreds of boutiques, selling everything from designer clothes to homeware, artwork to locally-made jewellery and plenty more unique finds. Treat your taste buds at a number of quality eateries, from laidback cafes to chic wine bars, fine dining restaurants to lively pubs. Head to the acclaimed Market which makes its own cheeses and breads, cures its own meats and grows fresh herbs and greens in its garden, serving up a delicious range of sandwiches among many other delights. Check out Pigeonhold (named Canada’s best new restaurant in 2015) for exquisite wine and sharing platters, or head to Clive Burger to sample some of Alberta’s best all-natural beef. This is also a buzzing nightlife zone, home to a wealth of bars, clubs and lounges. 17th Avenue extends towards the Saddle Dome stadium and when the Calgary Flames make the National Hockey League playoffs, the area’s venues become especially busy, creating an unbridled party atmosphere. If you happen to be in Calgary during the NHL season this is where you’ll want to head to get a taste of the city’s intoxicating sporting enthusiasm. Most bars and pubs along this strip have large TV screens for watching the game. One of the best is The Ship and Anchor, a local hotspot that attracts crowds to its coveted patio in summer and hosts regular live music performances throughout the year. This is another pedestrian-friendly inner city neighbourhood, encompassing 13 blocks filled with boutiques, bars, coffee shops, galleries, diners and ethnic eateries. The area is also commonly referred to as “Mission” in reference to its original settlement as a Catholic mission known as Notre Dame de la Paix in 1875. Characterful historic houses dating from this era contrast with an eclectic mix of new urban developments. The area is fast developing and attracts a young crowd contributing to a hip and exciting energy. Art fans won’t want to miss touring some of the district’s plentiful galleries. Two of the best are Loch Gallery, home to an impressive array of Canadian and European historical works, as well as Gainsborough Galleries, Calgary’s longest-established fine art gallery and a hotbed for some of the country’s finest impressionistic artists. This is also one of Calgary’s best-known dining destinations, so much so that the area’s main street is often referred to as “restaurant row”. 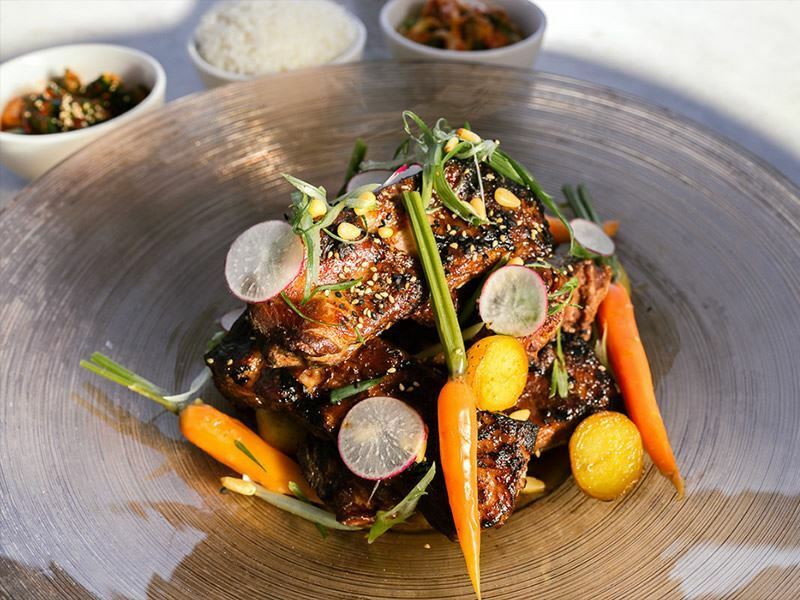 Anju is one of the most acclaimed spots, offering up a tempting array of Korean influenced tapas, whilst La Chaumiere boasts unbeatable French fare, wine and service. Mexican restaurant, Anejo, delights guests with mouth-watering tacos alongside more than 200 tequilas in a bright trendy venue, whilst Wurst is great for authentic Bavarian food, beer and live music. For late night drinks head to The Mission to unwind in sleek surrounds, or soak up the hipster vibe at Milk Tiger Lounge – both home to some of the best cocktails you’ll find in Calgary. This is Calgary’s oldest district, located close to the downtown core and home to the city’s original Main Street (now 9th Avenue SE). Inglewood contains a beautiful collection of over 200 heritage buildings and has managed to retain its quaint charm and strong community feel whilst fast-developing into a fashionable district home to an abundance of boutiques and restaurants. Antique lovers and home décor fans can spend hours browsing the eclectic stores that line 9th Avenue, whilst art aficionados can explore dozens of galleries and creative spaces, such as Esker Foundation. Several of the area’s historic buildings also house some of the city’s best places to eat, including Rouge restaurant, winner of the Pellegrino World’s Best Restaurants 2010 Award. Inglewood is also touted as Calgary’s hub for live music. Ironwood Stage and Grill, renowned as one of Western Canada’s premier live country and folk performance venues, is one not to miss. Endless more fun-filled venues can be found along what is known as Music Mile, especially renowned for its plentiful live jazz joints. The party atmosphere reaches full force in summer when the neighbourhood plays host to some of the city’s best festivals including Calgary International Fringe Festival and the Inglewood Sunfest. 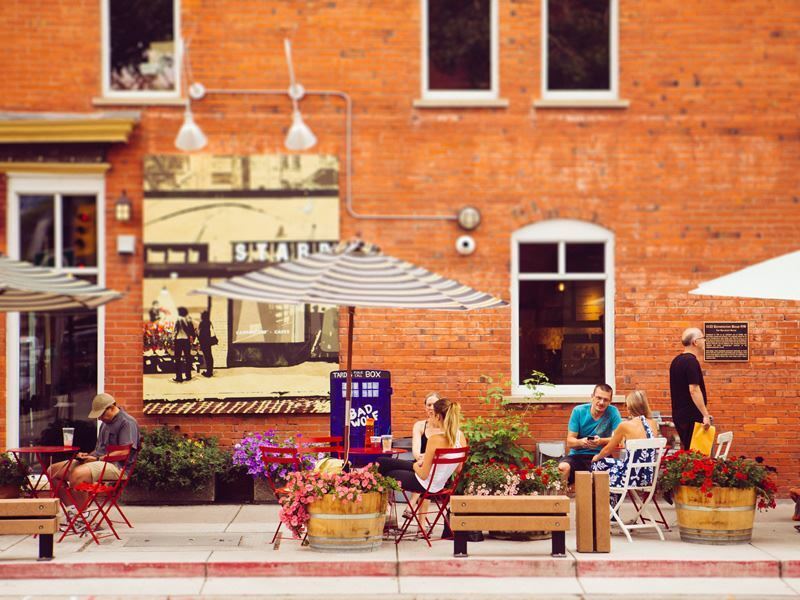 This ultra-trendy, laidback urban village is located across the Bow River just north of downtown. It’s one of Calgary’s most pedestrian-friendly areas and has even found its way into the list of Canada’s top neighbourhoods. Kensington boasts a strong independent streak, with its unique boutiques, cosy coffee shops and innovative restaurants. It also attracts a large student population from the nearby universities that lend the area a youthful upbeat atmosphere. Kensington is the place to come in Calgary to enjoy quality coffee in hip surrounds. Higher Ground Café is a classic, popular among local residents and students for its fantastic in-house roasted blends. The Roasterie attracts a more alternative crowd and is a great place for people watching. If you’re feeling peckish, this is also a great place to enjoy a leisurely lunch. The village is especially renowned for its Italian fare – check out Vero Bistro Moderne for fresh pasta dishes or Pucinella for mouth-watering wood-fired thin crust pizzas. Be sure to round off your meal with delicious sweet treats from Pie Cloud, Crave Cupcakes or Chocolaterie Bernard Callebaut. Next up, spend time browsing some of the city’s best indie bookstores, notably Pages or Shelf Life, home to many quirky and hard to find titles. Both are also hotspots for Calgary’s thriving literary scene, hosting regular readings by authors and poets. You’ll also find a wide range of fashion boutiques, gift shops and edgy home décor stores scattered about the streets. 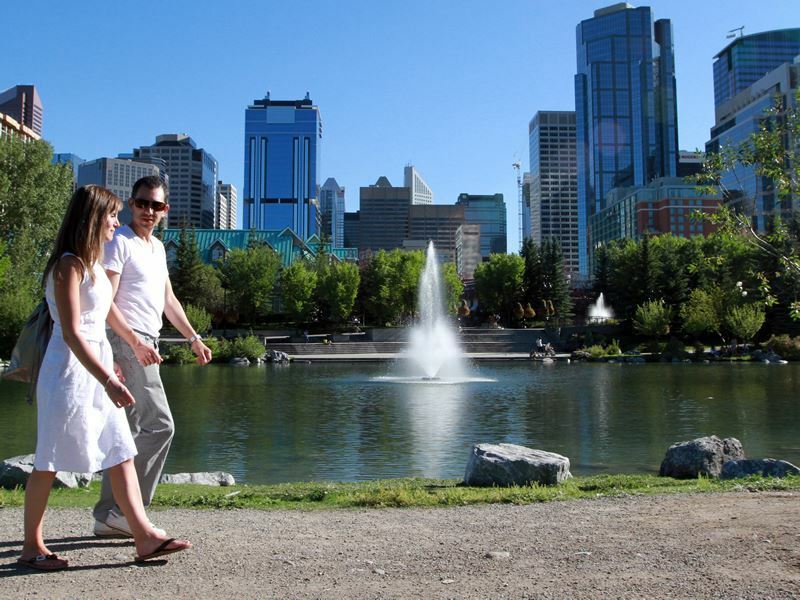 For a breather, the neighbourhood offers easy access to the beautiful trails and parks around the Bow River. Finish the day by catching an alternative film at the Plaza, one of the city’s only remaining indie movie theatres. 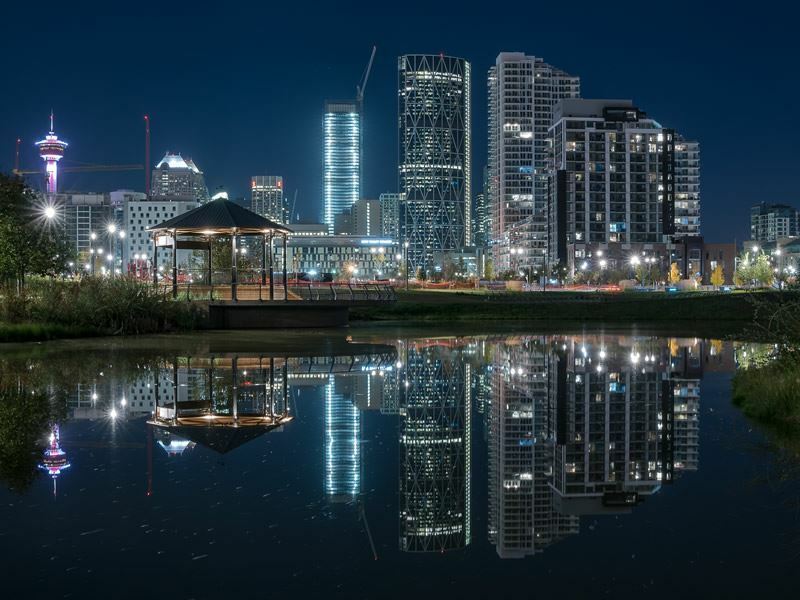 Canada’s fourth largest Chinatown, this distinctive section of Calgary is home to a thriving Asian community, packed with Chinese, Japanese and Vietnamese eateries, along with gift shops, grocery stores, bakeries and a handful of notable cultural attractions. Just a short hop from the downtown core, you’ll find strollable streets filled with plenty of cultural charm. Chinatown is also a great place to eat out and immerse yourself in a unique array of shopping, with bargain prices to be had. Don’t miss a visit to the Calgary Chinese Cultural Centre. It boasts a distinctive blue dome, modelled after the Temple of Heaven in Beijing, and functions as an active hub for the community and those interested in learning more about China. As one of Canada’s largest cultural centres, you’ll find an extensive array of programs and exhibits covering everything from martial arts and language classes, to dance lessons, table tennis and calligraphy. Last but not least is Calgary’s newest neighbourhood, situated directly east of the downtown area and overlooking the Bow River. Whilst this up-and-coming up district is still very much a work in progress, it does feature several notable attractions, both historic and brand new. RiverWalk, a 2km pedestrian and cycle pathway, offers a peaceful retreat from the urban bustle, as does St. Patrick’s Island, a lovely place to picnic on the river in summer. Numerous parks, innovative public spaces and art installations pepper the area, making it great for exploring on foot. Historic buildings are undergoing careful restoration, whilst new retail and dining venues are popping up fast. Pay visit to the recently opened Studio Bell, home of the National Music Centre. This venue explores the evolution of music in Canada across five floors of interactive exhibition space. Highlights include the Canadian Music Hall of Fame and its extensive collection of rare instruments and musical memorabilia. East Village is also home to Fort Calgary, the first outpost of the North West Mounted Police, set up in 1875 and which marks the city’s birthplace. Explore Calgary’s rich past through interpretive displays and authentic artefacts, tour the remains of the original fort, visit the historic Dean House, and explore over 40 acres of surrounding parkland at the confluence of the Bow and Elbow Rivers.